For many animal lovers, it’s obvious that you’d want a home with multiple pets, even if they’re different species. If your home has one or two canine family members, there’s a good chance at some point you may want to expand your family by adding a friendly feline to the mix. However, to make sure the transition to a multi-species household is a smooth one, there are several things to take into consideration before you head to the animal shelter to bring home your new kitty. While cats and dogs can indeed become best friends, the introduction process should be carefully planned out, and you should plan on being patient with all of your four-legged family members until everyone adjusts to the new living arrangements. If you’re ready to take the plunge and become a dog and cat household, here are some tips that can make it as stress-free as possible. Once you’ve picked out your new kitty and brought it home, plan on keeping it confined in a separate room for about a week or two. By doing this, it will have a chance to calm down and start getting used to the sights and sounds of its new home. First, make sure the room you choose is cat-proof (no wires, nothing dangerous that could get knocked over, no toxic plants, etc.). Keep its food, water, litter box, and anything else you’d like it to get comfortable within this room. This can include things like a bed, toys, and a scratching post. Check on the cat occasionally and speak in calm, soothing tones while you visit it. This stage of the introduction is just to help your cat get over the initial shock to the system of being placed into a completely new environment, especially since she’ll be able to smell a dog in the house. Don’t rush this stage, as it’s imperative that she’s feeling as safe and comfortable as possible before having actually to meet your dog(s). 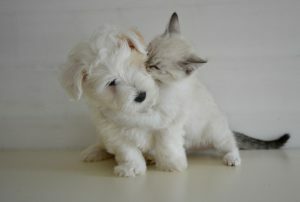 After kitty has settled in a little bit, introduce each animals’ scent to the other. Place a towel in each of their beds and after they’ve had a chance to sleep on it a time or two, take the towel and give it to the other animal. While they can no doubt vaguely smell each other in the home, this confrontation of scents is important for them to get to know each other. When you’re ready, there are a couple of things you can do to start the process of meeting. I suggest getting a (very sturdy) baby gate that you can place at the door of the cat’s room and then leave the door open for awhile. At this point, you can consider bringing the dog around to look in the room and finally lay eyes on the new cat. Take extra precautions here, and ensure your dog is leashed for the first few meetings. Do this for a few days, letting them inspect each other for longer and longer each time. When you think it’s time for kitty to explore the rest of the house, there are a couple of options. One is to have your dog play outside for a little bit while Kitty gets a chance to explore. This might be a good first step to ending her confinement. Another option (or perhaps Step 2), is to keep your dog on a leash and calmly introduce the two of them by having the cat explore the house and come meet the dog. If they’ve already seen and smelled each other for a week or two before this happens, they should be at least moderately comfortable with each other. Continue supervising interactions between your pets until you’re sure they can be calm and respectful of each other’s space (for the most part). While it’s only natural there may be a bit of growling or hissing initially, beware of any behaviors that look as if they could lead to a knock-down, drag-out battle that could leave someone hurt. If your dog is somewhat large, they could easily injure the cat if they chase it or pick it up and bite it. We have actually created a game to help stop your dog from chasing your cat, should this occur. 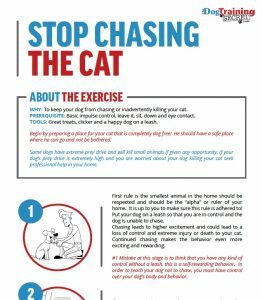 Click here to download the next step of the Stop Chasing The Cat Game. Likewise, one swipe across the dog’s face from a cat and its claws could lead to an injured face or eye. If you do witness this type of behavior, take things slow, and give each more time to get to know each other before introducing them again. 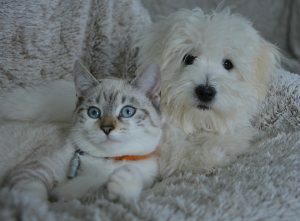 Before you ever introduce your cat and dog, it’s a good idea to take everyone to the veterinarian for a check-up. In doing so, you can make sure there are no underlying health problems that may be making one or both animals feel less than perfect. You can also get everyone up-to-date on their vaccines, flea treatments, and other procedures that may be needed. By having Fluffy and Fido feeling their best from day one, the chances of a successful introduction increase dramatically. Even if your dog has completed formal obedience training, it may be a good idea to have a refresher course prior to meeting the new kitty. Practicing sit, stay, and other basic commands, you’ll get your dog used to behaving itself at all times. And to reinforce the good behavior, always provide a favorite treat for a job well-done. Unfortunately, some dogs like to eat cat food, and also are prone to raiding the litter box. This intrusion into a cat’s space can be traumatizing for the kitty. It could stop using its feeding station or litter box, which will, of course, lead to health issues and “behavior” problems like peeing on your carpet or furniture. To keep this from happening, place the cat’s food and litter box in an area that is not accessible to the dog. This could be in a closet where the door is opened just enough for the cat to enter, or even behind a baby gate that could be installed in a doorway. Although I always find it a bit risky, some people even put their cat’s items somewhere higher up where the dog can’t access it. No matter what option you choose, doing so will help eliminate many potential problems between Fluffy and Fido. Food stations and litter boxes must always be a safe space for your cat if you want to steer clear of health and behavior issues. This doesn’t work for everyone, obviously, but if the dog in your home happens to be a puppy, it may be a good idea to have your new cat be a kitten that is about the same age as your puppy. If you have this situation in your household, you’ll the chances of a pain-free introduction are much higher. Since they’ll both have plenty of energy for playing, each might welcome having a new playmate in the house. Plus, they will have the opportunity to grow up with one another and will have a furry friend by their side for many years to come. If your best plans for a happy household aren’t progressing as well as you’d like, don’t give up hope. Rather than quit and possibly return the kitty to the shelter, don’t be hesitant to ask for help. 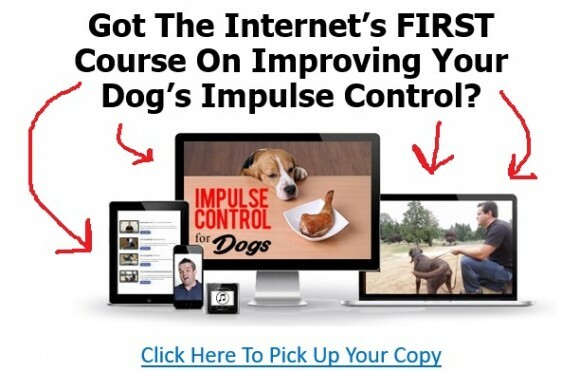 In today’s world, there are plenty of animal behaviorists around who are more than willing to offer their services in an effort to create harmony in your household. In most cases, your veterinarian may be able to offer suggestions on getting your dog and cat to like one another or can refer you to an animal behaviorist or animal psychologist in your area who may be able to help. If you prefer a more DIY approach, don’t forget the convenience of a course available online that you can go through and come back to whenever it’s necessary. Just like humans, our pets sometimes need a sympathetic ear and shoulder to cry on in order to get their lives back on track, so consider this option if necessary. Whether you’ve got a puppy and kitten who will get to grow up together, or perhaps an older dog who has had the house to itself for a few years and suddenly finds itself facing a furry feline, be patient with everyone during the introductory phase. By doing so, you’ll set the stage for letting your pets provide you with many years of joy and happiness. Emily Parker is a cat mom to two black cats, Gus and Louis. When she’s not exploring her neighborhood for the coolest new (cat) cafes, she’s researching and writing for her cat behavior website, Catological.com.